dSection of Child Neurology (T.S. ), Children's Hospital Colorado, University of Colorado School of Medicine, Aurora, Colorado. BACKGROUND AND PURPOSE: Enterovirus D68 was responsible for widespread outbreaks of respiratory illness throughout the United States in August and September 2014. During this time, several patients presented to our institution with acute flaccid paralysis and cranial nerve dysfunction. The purpose of this report is to describe the unique imaging findings of this neurologic syndrome occurring during an enterovirus D68 outbreak. MATERIALS AND METHODS: Patients meeting a specific case definition of acute flaccid paralysis and/or cranial nerve dysfunction and presenting to our institution during the study period were included. All patients underwent routine MR imaging of the brain and/or spinal cord, including multiplanar T1, T2, and contrast-enhanced T1-weighted imaging. RESULTS: Eleven patients met the inclusion criteria and underwent MR imaging of the brain and/or spinal cord. Nine patients presented with brain stem lesions, most commonly involving the pontine tegmentum, with bilateral facial nerve enhancement in 1 patient. Ten patients had longitudinally extensive spinal cord lesions; those imaged acutely demonstrated involvement of the entire central gray matter, and those imaged subacutely showed lesions restricted to the anterior horn cells. Ventral cauda equina nerve roots enhanced in 4 patients, and ventral cervical nerve roots enhanced in 3, both only in the subacute setting. 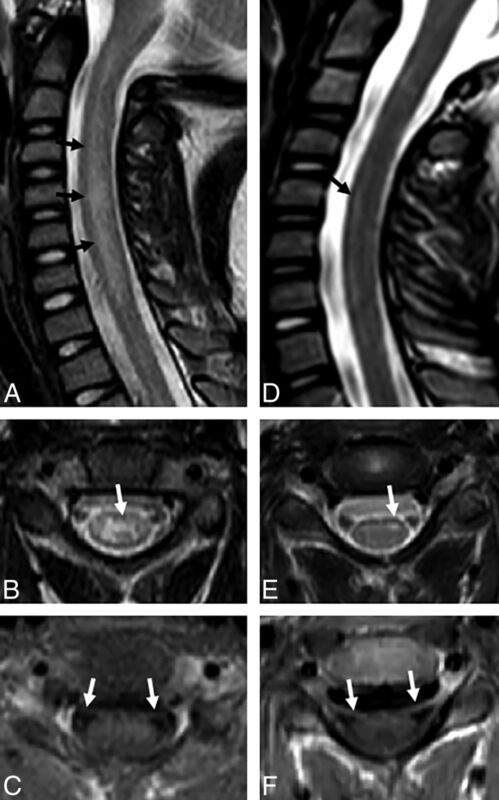 CONCLUSIONS: Patients presenting with acute flaccid paralysis and/or cranial nerve dysfunction during the recent enterovirus D68 outbreak demonstrate unique imaging findings characterized by brain stem and gray matter spinal cord lesions, similar to the neuroimaging findings described in previous outbreaks of viral myelitis such as enterovirus 71 and poliomyelitis. Enteroviruses have been associated with neurologic syndromes previously, most notably enterovirus 71 (EV-71). 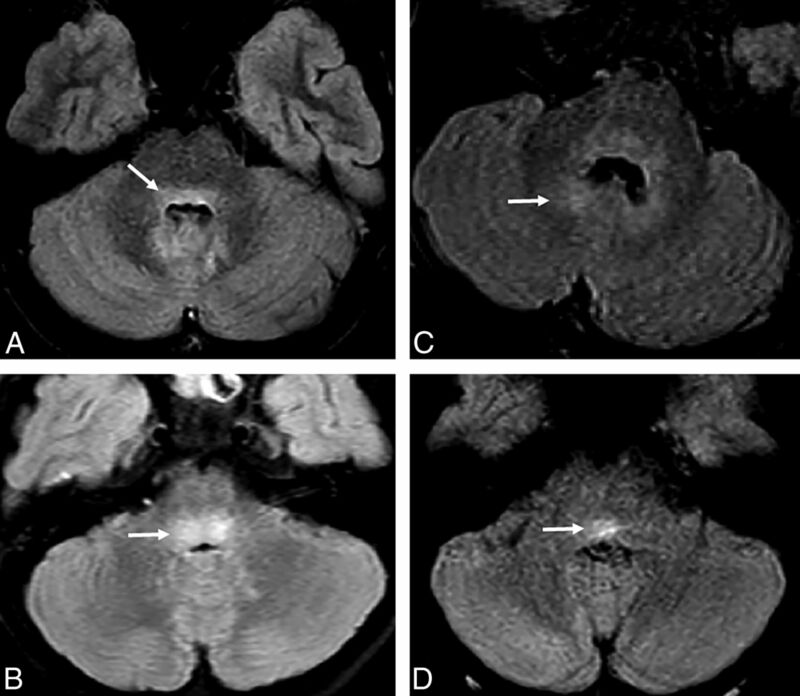 EV-71 most commonly presents with nonneurologic manifestations but has been associated with multiple outbreaks of AFP and brain stem encephalitis throughout the world.9⇓⇓⇓⇓⇓–15 MR imaging in affected patients typically reveals a rhombencephalitis affecting the dorsal pons and medulla, and a radiculomyelitis with a predilection for the anterior horn cells of the spinal cord and ventral nerve roots, findings that have also been described in poliomyelitis.16⇓⇓–19 Although EV-D68 has not been proved as the causative agent in this cluster, these cases demonstrate distinctive imaging features that are very similar to the neuroimaging presentation of both EV-71 and poliovirus. We present an imaging-based report describing in detail the MR imaging findings of neurologic diseases associated with an EV-D68 outbreak. Patients who presented to our institution from August 1, 2014, to October 1, 2014, with symptoms of AFP and/or cranial nerve dysfunction and with lesions in the brain stem or spinal cord gray matter on MR imaging were included. Imaging was performed on a 1.5T or 3T Ingenia (Philips Healthcare, Best, the Netherlands) or a 1.5T Avanto unit (Siemens, Erlangen, Germany). Ten of 11 patients underwent MR imaging of the brain, 7 had MR imaging of the entire spine, 2 had MR imaging of the cervical and thoracic spine only, and 1 had MR imaging of the cervical spine only. One patient did not undergo dedicated spine imaging. Parameters and specific sequences of various MR imaging brain examinations were variable, though each patient underwent isometric 3D T1-weighted gradient-echo imaging before and after intravenous administration of gadobenate dimeglumine (TR, 8.19–8.79 ms; TE, 3.77–4.60 ms; NEX, 1; section thickness, 1 mm), axial T2-weighted FSE (TR, 3500–10,000 ms; TE, 80–110 ms; NEX, 1 or 2; section thickness, 2–4 mm), FLAIR imaging (TR, 4800–11,000 ms; TE, 125–330 ms; NEX, 2; section thickness, 1 or 4 mm), and axial gradient echo T2*-weighted imaging (TR, 550–900 ms; TE, 23–26 ms; flip angle, 18°-20°; NEX, 1 or 2; section thickness, 4 or 5 mm), or SWI (TR, 18.36–19.34 ms; TE, 25–27 ms; NEX, 1; section thickness, 2 mm). Spinal imaging included precontrast axial and sagittal spin-echo T1-weighted (TR, 450–650 ms; TE, 8–10 ms; NEX, 2 or 3; section thickness, 3 mm), T2-weighted (TR, 3000–3500 ms; TE, 100–120 ms; NEX, 2 or 3; section thickness, 3 mm), and contrast-enhanced axial and sagittal T1-weighted images. All scans were reviewed independently by 3 fellowship-trained pediatric neuroradiologists. Eleven patients met the inclusion criteria. The patient demographics, presenting symptoms, vaccination history, diagnostic work-up, and clinical course have been detailed elsewhere (K.M. et al, unpublished data, 2014) and are summarized in the On-line Table. Briefly, patients presented with neurologic symptoms following a febrile upper respiratory illness, including limb weakness in 8 patients and cranial nerve dysfunction in 9. Involved cranial nerves were VI, VII, IX, X, XI, and XII. Eight patients tested positive for rhinovirus/enterovirus in the nasopharynx, 4 of which were subtyped as EV-D68 (On-line Table). Findings of enteroviral polymerase chain reaction of the CSF were negative in all patients. Testing for West Nile virus and other arboviruses, herpes viruses, Mycoplasma pneumoniae, parechoviruses, and poliovirus was also negative. On MR imaging, lesions were identified in the brain stem in 9 patients. The pontine tegmentum was the most common site of brain stem involvement, showing increased T2 signal in 8 cases (Fig 1). A ventral pontine lesion in a ninth case was associated with bilateral facial nerve enhancement (patient 7, Fig 2). Lesions were identified in the midbrain in 2 cases, including the bilateral substantia nigra in 1 case (patient 3, Fig 2), and in the medulla in 5 cases. The dentate nuclei were abnormally T2 hyperintense in 2 cases. No supratentorial lesions were identified. Noncontrast FLAIR images through the dorsal pons demonstrate a variety of types of T2 hyperintensity. A, In patient 4, T2 hyperintensity in the dorsal pons (arrow) extends into the dentate nuclei. B, In patient 2, more focal and intense T2 signal is localized in the dorsal pons (arrow). C, In patient 6, ill-defined and less intense signal in the dorsal pons extends to the dentate nuclei (arrow). D, In patient 10, more focal and T2 hyperintensity is seen within the dorsal pons (arrow). Atypical appearance of CNS disease includes T2 hyperintensity localized to the substantia nigra in patient 3 (white arrows, A and B). In patient 7, the facial nerves abnormally enhance bilaterally (white arrows, C) and the left ventral pons has an atypical T2 hyperintense focus (black arrow, D). There is also more ill-defined hyperintensity in the dorsal pons (white arrow, D). Ten patients had spinal cord lesions involving the central gray matter (On-line Table and Figs 3 and 4). The spinal cord lesions consisted of either ill-defined, nonenhancing T2 hyperintensity throughout the entire central spinal cord gray matter (Fig 3A–C) or a more well-defined T2 hyperintensity confined to the anterior horn cells (Fig 3D, -E). A single patient, patient 1, underwent both acute (day 3) and subacute (day 38) imaging. In this case, the pattern of spinal cord T2 hyperintensity evolved from diffuse central gray matter involvement acutely to an anterior horn cell pattern in the subacute phase (Fig 4). The cases with ill-defined diffuse central gray matter involvement were all imaged earlier than cases with well-defined anterior horn cell signal abnormality (median of 3 days after symptom onset versus 27.5 days, with no overlap between groups). Cord lesions uniformly affected the cervical spine, with decreasing involvement inferiorly. In 4 cases, the lesions extended the entire length of the cord, from the cervicomedullary junction to the conus medullaris (Fig 4). All brain and spinal cord lesions were nonenhancing. A–C, In Patient 2 scanned at 2 days, the central cord hyperintensity is more ill-defined and involves the entire central gray matter (black arrows, A; white arrow, B). Nerve roots do not enhance (white arrows, C). D–F, Patient 8, scanned at 25 days, demonstrates T2 hyperintensity confined to the anterior horn cells asymmetric to the left (black arrow, D; white arrow, E) and nerve root enhancement (white arrows, F). 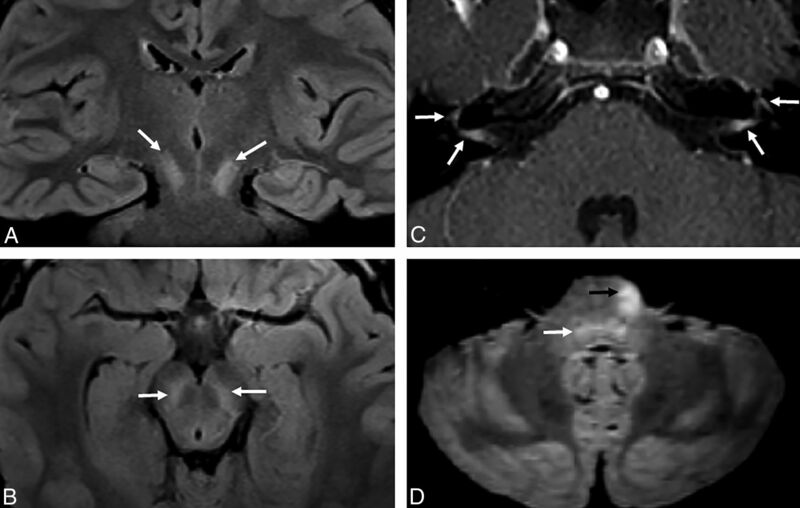 A–D, Acute imaging performed at 2–3 days in patient 1 demonstrates T2 hyperintensity in the right dorsal pons (white arrow, A) and more ill-defined central gray matter hyperintensity seen more commonly in the acute phase (white arrows, B and C; black arrows, D). E–I, Subacute imaging of the spine performed in the same patient at 38 days demonstrates contraction of the cord T2 hyperintensity to focally involve the anterior horn cells (black arrows, E; white arrows, F and H) and nerve root enhancement of ventral cervical roots (white arrows, G) and the cauda equina (white arrows, I). Ventral cauda equina nerve root enhancement occurred in 4 patients (Fig 4), though only 3 had clinical findings of lower extremity weakness. Cervical nerve root enhancement at the levels of spinal cord gray matter T2 hyperintensity and clinical weakness was also detected in 3 patients. Those cases with nerve root enhancement were imaged later than those without (median of 27.5 days after neurologic symptom onset versus 3 days after symptom onset, with no overlap between groups). Rhombencephalitis and AFP have been reported as uncommon complications of EV-71 infections.9⇓⇓⇓⇓⇓–15 Multiple case series have described MR imaging findings in cases of EV-71 neurologic disease, including nonenhancing dorsal brain stem T2 hyperintensity,9,11,15,20⇓⇓⇓⇓–25 long-segment T2 hyperintensity of spinal cord anterior horn cells,11,15,20,23,25,26 nerve root enhancement,11,15,20⇓–22,25 enhancement of anterior horn cells or brain stem,11,15,20,24 and substantia nigra involvement.11 Similarly, several case reports of MR imaging findings in poliomyelitis have also described dorsal brain stem T2 hyperintensity,16 anterior horn cell T2 hyperintensity,17⇓–19,27,28 anterior horn cell enhancement,19 and substantia nigra T2 hyperintensity.16,17,29 Some published cases of AFP caused by West Nile virus have also reported comparable imaging findings of anterior horn–predominant spinal cord lesions and ventral nerve root enhancement.30,31 The similarity of the MR imaging findings in this case series to these past reports of virally mediated myelitis suggests a similar direct viral pathogenic effect. Other patients with less stereotyped findings include a single patient with diplopia and cranial nerve VI palsies with bilateral substantia nigra T2 hyperintensities (patient 3, Fig 2), which has been described more frequently in poliomyelitis.16,17,29 Imaging of another patient who presented with bilateral facial nerve palsies revealed a small, nonenhancing ventral pons lesion and bilateral facial nerve enhancement (patient 7, Fig 2). Although facial nerve palsies are frequently reported in EV-71 infections,24 to our knowledge, this is the first report of both facial nerve enhancement and a unilateral ventral pontine lesion in the context of suspected enteroviral CNS disease. Details on treatment of this cohort are described elsewhere (K.M. et al, unpublished data, 2014). To date, most of these patients have residual deficits. Long-term outcomes are unknown. Continued radiographic and neurologic follow-up will be critical to our understanding of the course of this condition. 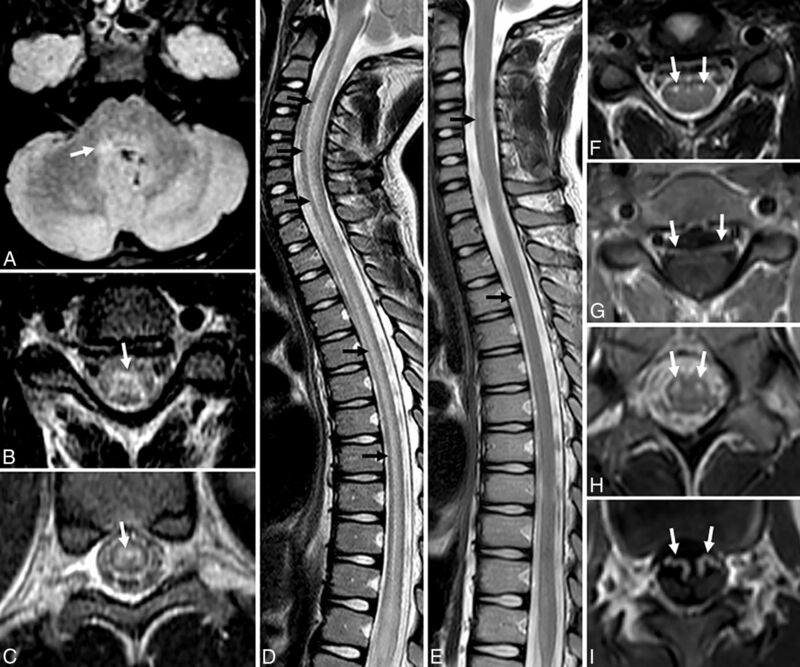 This series of children presenting with neurologic disease after a respiratory illness during an EV-D68 outbreak shares a characteristic pattern of MR imaging findings previously described in past outbreaks of EV-71 neurologic disease, West Nile virus–associated AFP, and poliomyelitis. MR imaging findings in this series include brain stem lesions preferentially involving the pontine tegmentum, spinal cord lesions of the central gray matter acutely and anterior horn cells subacutely, and cranial and spinal nerve root enhancement. The marked similarity of these imaging findings in our cohort of patients to those reported in EV-71, poliomyelitis, and West Nile virus is very suggestive of a direct viral effect. Recognition of these findings is critical to aid clinicians as they consider therapeutic interventions. J.A. Maloney and D.M. Mirsky are co-first authors of this article. Disclosures: Teri Schreiner—UNRELATED: Grants/Grants Pending: Environmental and Genetic Triggers of Pediatric MS,* Comments: This is a National Institutes of Health–funded study. I am in 1 of 14 sites that are participating in the study. Money was paid via contract to the University of Colorado; Payment for Lectures (including service on Speakers Bureaus): Consortium of MS Centers, Comments: I was paid $500 (plus travel expenses) to provide a lecture at the annual meeting of the Consortium of MS Centers in May 2014. *Money paid to the institution. CDC Health Alert Network. Acute neurologic illness with focal limb weakness of unknown etiology in children. September 26, 2014. http://www.bt.cdc.gov/han/han00370.asp. Accessed October 6, 2014. Accepted after revision October 25, 2014.